When people ask me what the next LG flagship will be like, I usually say “different”. Lacklustre sales aside, one must compliment the company for daring to innovate, while everyone else takes the safer routes. In a way, the LG G5 is the culmination to everything the company has done over the past few years. LG was amongst the first to introduce a laser auto-focus on phones, followed by a truly curved display, and now it beat Google to the first modular phone ever. It’s sad that LG’s phones haven’t sold like its competitors, but the company has only itself to blame. The LG G5 may be a modular phone, but it isn’t quite what I hoped for. There are things about the G5 that I absolutely love, but then, I’m also disappointed. Let me explain how with the LG G5 review. The LG G5’s story is one of conflict. While I absolutely love how ergonomic this phone is, I’m not convinced with the looks. It looks quite unique, but good? I doubt many would agree to calling this an attractive phone once they've held it. It also doesn’t feel like an out and out premium flagship. Metallic builds usually feel more…metallic. There’s a certain plastic-like quality about the G5, one that I can’t really come to terms with. LG has clarified that the phone is made out of an aluminium alloy, but this isn't the anodised aluminium you see on iPhones etc. It’s a phone that looks premium in photos, but doesn’t quite feel the same. There’s a button on the bottom left of the G5, which unlocks the modular elements. Pressing this makes the battery pop out and you can add other modules. I haven’t tested the other modules yet, but it’s not a very seamless mechanism. On the other hand, the button is done right. It sits flush with the body, and is neither easy, nor very difficult to press. This is important, since it keeps you from accidentally pressing it by mistake, and turning the phone off. That, by the way, is one of the errors in execution. 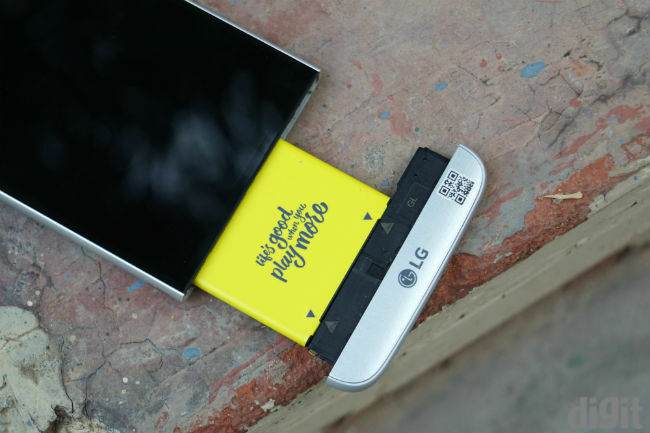 The LG G5 turns off the second you pull out the battery module to fit another one. A better arrangement would be to have temporary power, to give you enough time to change modules, without turning off the phone. I haven’t tried the modules yet, but detaching and attaching the battery is enough to ascertain that this isn’t a particularly seamless experience. You’ll get a hang of the button, and the fact that you have to dig your nail into it, quickly enough, but that doesn’t make up for the actual detaching mechanism. After pressing the button, the G5’s bottom comes out, but you still have to more or less yank it out. This can be cumbersome, especially when you’re in a hurry to swap out a part. I kept imagining a scenario where I’m swapping out the bottom for the Cam Plus module to take a shot I really want to, and in the hurry, the top part flies out of my hand. While the battery module fits back in tightly, I’m not quite certain whether this will stand the test of time. This is because when I put the module back in, I usually had to fish for the right position. It’s not difficult, but it’s not particularly seamless either. Lastly, when you put the module back in its place, you feel a locking mechanism working inside, which makes me further question the longevity. What happens if this mechanism gives way? Modularity also poses another very real question. LG currently has only two modules available – the LG Cam Plus and the Hi-Fi Plus. The Cam Plus module costs Rs. 6,500, according to the Flipkart listing. But why just two? I understand LG has no plans to make any more modules by itself, which means a third party ecosystem is necessary. But, in order to get those third parties interested, it has to sell enough units of the G5. As a consumer, I have to ask myself whether I’m fine spending around 50K on a phone, the main feature of which, I may not be able to use. Further, the fact that the G5 is modular means LG’s next flagships/devices will have to look similar. Asking consumers to buy modules now, and having them become obsolete for the next flagship, will be a horrendous mistake. It’s the same reason why Samsung couldn’t put a USB Type C port on the Galaxy S7 Edge, because it had to fit the Gear VR. The geek inside me leaps with joy at LG’s innovation, but as a reviewer, I find that there’s work to do and questions to be answered. The 5.3 inch QHD display on the LG G5 has a pixel density of 544 ppi, and it’s one of the best in the market. Samsung’s Galaxy S7 Edge still has better black levels, but it’s barely discernible to an untrained eye. LG has used the same In-Cell Touch technology from the G4, and like that device, this is easily amongst my favourite displays this year. It’s the right amount of warmth, and doesn’t oversaturate colours, like the Super AMOLEDs. That said, when using auto brightness, there’s a weird effect on the G5. I only got to see it a few times, because Delhi’s weather this week has mostly been cloudy. When using the phone under direct and bright sunlight, the brightness is automatically pushed up. I’d say the G5’s display does about the double the brightness of a Lenovo Vibe X3. But, when it reaches maximum brightness, it starts dimming down. If you look closely, it seems like the backlight can't retain the brightness, possibly due to overheating. I can’t be sure whether this is actually the case, but it looks very similar. The same happens indoors as well, but that’s more gradual, and is actually LG's auto dimming feature integrated with the display. Indoors, you’ll see the display dimming down after about a minute or so, and that’s most likely to go easy on your eyes. Speaking of which, the Always On display on the LG G5 is as much of a gimmick as it was on Samsung's flagships. Neither of these companies have been able to implement it the way Motorola has. On the G5, you can choose to show the time and date, or add a personal message above the date. What differs here, though, is that Samsung's AMOLED displays could light up individual pixels, while the G5 has an IPS panel. This means that the entire display has to come on. The Always On display on the G5 seems to dim, and if you can easily notice that the entire display is turned into a shade of grey. Theoretically, it consumes more battery than the AMOLED panels, but it's not very evident. LG’s UI is one of those UIs that you can neither praise nor really dismiss. There are features here that make sense. For example, you can add two extra buttons to Android’s stock touch buttons. I chose to make one of these the Notification Drop down, and not having to reach for the top of the phone made it feel all the more ergonomic. That said, the choice of what buttons you can add is severely limited. There’s also the fact that you get a lot of control over the camera. LG’s camera app brings you manual modes, a bunch of regular modes, Slo-Mo and more. It’s one thing you can’t complain about. When you take the phone out of the box, you’ll miss the app drawer, but LG allows you to bring that back through a few button presses. The same can be done on the Settings Menu, which is divided into various sections by default. Personally, I see no big mentionable fault with LG UX 5.0, but I’ve heard multiple people complain about it. It is of course, built on Android Marshmallow. It’s worth noting that Marshmallow’s adoptable storage feature is not supported by the G5, just like the Galaxy S7/S7 Edge. It would suffice to say that the LG G5 is one of the fastest smartphones in the market right now. This is the first fully clocked Snapdragon 820 that we’ve tested right now, and the G5 leaves little room for questions. You can play games and multitask to your heart’s content, and there’s 4GB of DDR4 RAM to aid the latter. Surprisingly, though, the G5 doesn’t do as well as the Galaxy S7, in browsing performance. I can only attribute this to LG’s software, since the SD820 doesn’t really show such effects in the Mi 5. Compared to the Samsung flagship, the LG G5 shows very slight stutters while browsing on Chrome. Facebook’s Instant Articles also open with a split second stutter, which is unpleasant coming from a flagship smartphone. But browsing aside, this is one of the fastest phones you can find in the market right now. It retains sub-40 degree temperatures, even when the processor is near the top clock speed, and it can do so, even in non-air conditioned rooms, with the room temperature at around 30 degrees. It’s also worth noting that LG has used UFS 2.0 storage on the G5, which makes a significant difference in real world performance. Switching from the LG G5 to the Huawei Nexus 6P, I could feel the significant performance difference between the two. This became even more apparent when gaming on the two devices. The LG G5 is about 35% faster than the Nexus 6P, and pretty much as fast as a Samsung Galaxy S7 Edge. It can sustain peak performance for much longer than the Snapdragon 810-powered device. Suffice to say that if you’re using a generation or older smartphone and want to upgrade to the G5, you will be buying a more powerful smartphone. Call quality on the LG G5 is perfect, with no distortion on either side. I didn't see any irregular signal drops, and the phone latches on to mobile networks quite fast. While LG wants you to use the Hi-Fi Plus Audio DAC for better sound, the G5's own audio isn't very bad either. It's sufficiently loud, and has a hollow feeling about it. This may not suit every one, but I prefer it over many other smartphones out there. I tried using the Sony MDR 100ABN Bluetooth headphones and the much cheaper Mi-In Ear Headphones, with this, and they both worked fine, with good audio performance. The power on/off button on the back doubles as the fingerprint sensor, which is quite convenient. Surprisingly, though, the G5's sensor seemed to miss my print a few times more than usual. Here, the modularity comes into play once again. For one, I suspect that the modular panel forced LG to choose a smaller battery. Secondly, the fact that an additional battery pack would make for an extra module to sell means a smaller battery makes better business sense. You can always ask the user to buy an additional battery module if he or she doesn’t like the battery life. Having said that, with the screen on auto brightness, the 2800 mAh battery on the LG G5 lasted me for about 10 hours on pretty heavy usage. This included 4 phone calls, about 35 minutes of gaming, quite a few images clicked, one short video, and lots of IMs and emails. This is pretty much the industry standard for smartphones, but it definitely doesn’t qualify as good battery life. The Samsung Galaxy S7 Edge, with its considerably bigger battery life, had lasted me 16.5 hours on similar usage. I could try and make the G5 last me a few more hours, and I did, but it wouldn’t last me one full day. That said, neither would the Samsung Galaxy S7 Edge or the Xiaomi Mi 5. The LG G5 supports Qualcomm's Quick Charge 3.0 technology, which helps it charge really fast. It charges from 22% to 95% in about 35 minutes. However, charging over USB is a lost cause, especially if you're using the phone while charging. LG hasn’t explicitly said it, but the wide angle lens on the G5 is most certainly a fish eye lens. 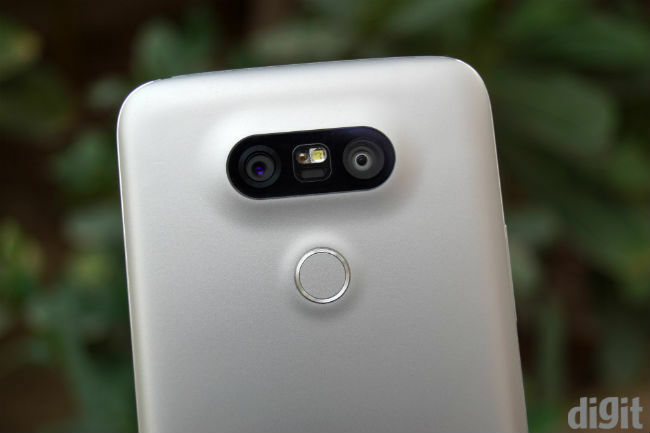 To clarify, the LG G5 has two cameras – a 16MP primary sensor, and an 8MP wide angle camera. While the field of view for the primary lens stands at the usual 70 degrees, the fish eye wide angle lens can cover 135 degrees. This poses another conflict for me. While the benefits of a fish eye lens aren’t lost on me, I’m no photographer, and I can’t always figure out when a fish eye lens will be handy. These lenses cause barrel distortion, meaning photos appear spherical, instead of linear. Now, if you’re good with cameras, you can really put these to good use, but if you’re not, you may struggle as I did. Also, the shorter focal length of the wide angle camera makes objects in the image look shorter. (Notice the building behind the two cars in the gallery below). Images clicked by the 8MP sensor aren't as good as the primary sensor, but they'll work for basic sharing and Facebook. That said, if you're shooting videos using the fish eye lens, under low light, you'll have a tough time. The video below has been clicked using the G5, from a fast moving vehicle. It starts with the 8MP camera, and brightens when I switch to the primary camera. 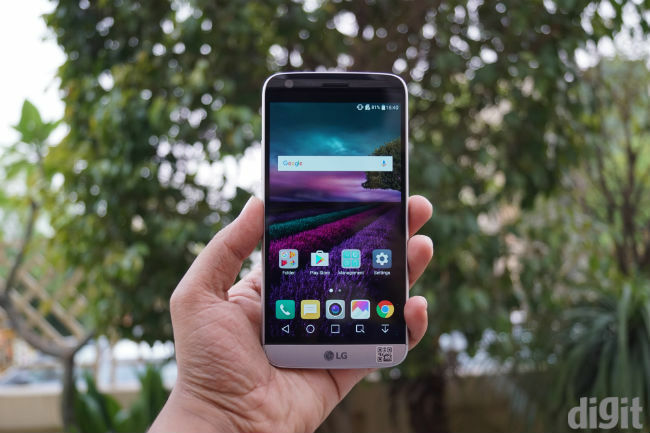 The LG G5 supports both OIS and EIS (Electronic Image Stabilisation), which allows the video to be stable, even from a wobbling, moving vehicle. You have the option to turn off EIS and use only OIS, but that makes stabilisation a little less effective. The 16MP camera on the G5 is pretty great, though. Given the right light, it takes great photos, but I wish they were a tad brighter. Under low light, the G5 lags behind the Samsung Galaxy S7 Edge, but is still respectable. Bottomline, most of your images taken by the LG G5 will look great. Colours are accurate and the details are really good. Lower the light and images start deteriorating, but there are many phones that’ll do worse. We barely get to see innovation in the smartphone space anymore, and LG is one of the few companies that dare. The modular design on the G5 isn’t perfect, but I think it’s a more functional innovation than the Edge displays on Samsung’s devices. The irony is, while the geek in me sincerely wishes that LG succeeds with this device. To be clear, I favour the Edge simply because its camera is better under low light, and that it looks better to me. The LG G5 is every bit as fast as any other flagship today, and if you do choose to buy this, you can take heart in knowing that you have one of the most powerful phones in the market. The modular design needs more thought and a lot of support from third parties, but this review must end by congratulating LG for trying something new, yet again.